One Dianara v1.2.5 coming up! Hi! As planned, here’s a new release of Dianara for the end of the year. Some of the main new features are the new Mentions and Actions feeds, which are basically the same as the Meanwhile feed, but with only activities addressed to you, and only activities done by you. Then, the expandable labels. Some of the information labels such as the “10 minutes ago” or “7 likes” in posts will expand when clicked, to show extra information. Some parts of that extra information was available previously in tooltips, but now that extra information might contain clickable links, too, such as user names. Also, the way of showing when a post got to your timeline via sharing is clearer and more informative, and pasting a link that looks like it’s pointing to an image will ask if you wish to insert it as a regular link or as a visible image. Mentions and Actions feeds. Access them via keyboard with Control+1/2/3 (keyboard shortcut to reload Meanwhile feed has been changed to F2). Made some of the labels expandable; they will show extra information when clicked. Offer to insert links to image files as embedded images, when pasting. Very long post titles will be cut when posting. 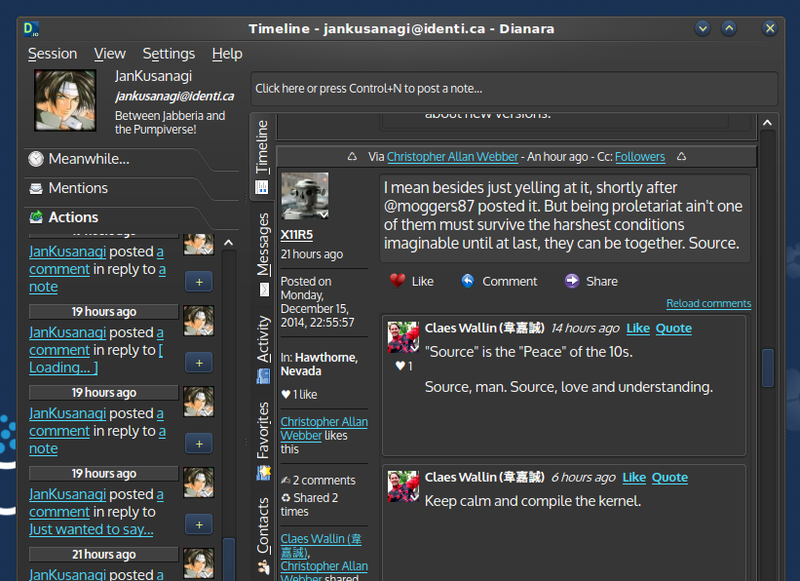 Shared posts now show sharer’s information in a wide line at the top. Show warning when posting only to Followers, but having none. Added new configuration categories, and rearranged some options. Added option to show post client information directly. Option to insert basic tables in messages. Avatar menus now sync their Follow/Unfollow option based on global contact list changes. Added Control+Enter shortcut for the “Done” button when selecting specific recipients for a message. Enhancements in the experimental group support. Added a few changes to support GNU Mediagoblin‘s upcoming Pump.io API. You’ll be able to use Dianara to post to Mediagoblin sites once its 0.8.0 version is out. Added links to the Pump.io User Guide (https://github.com/e14n/pump.io/wiki/User-Guide). Fixed #4: some memory leaks, thanks to a patch by Gregor Herrmann. Fixed wrong order in list of likes in posts. Fixed extra spaces inserted when creating links in the middle of some existing text. Dianara 1.2.5 is available in English, Catalan, Spanish, Italian and German languages. There’s a partial Polish translation included. You are currently browsing the Jan+KDE blog archives for December, 2014.